Dangerous hunt for two 1969 Camaros. You couldn’t ask for a better chance to own an iconic Chevy muscle car on the cheap. 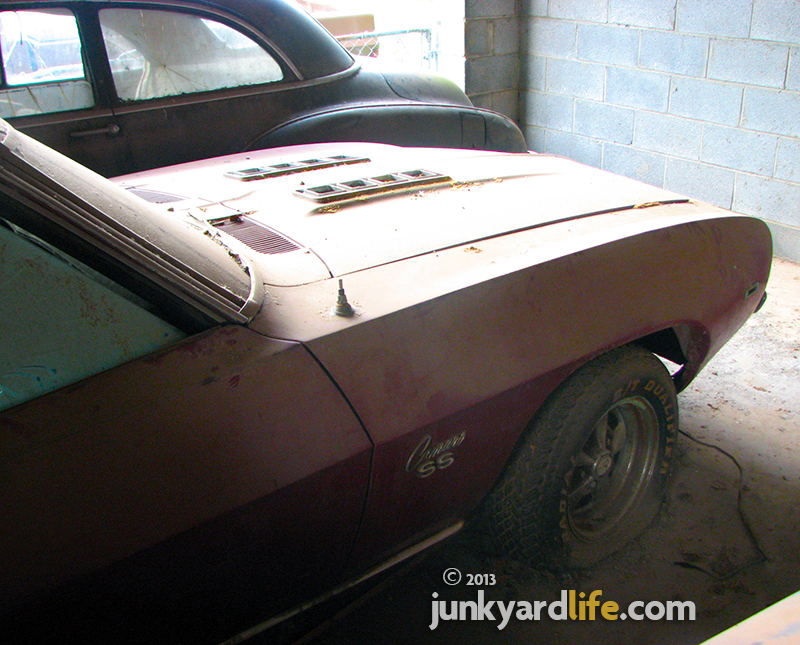 Two ’69 Camaros hidden in a neighborhood that few dare to enter. The owner, missing for more than a decade, was out of the picture, but a relative was ready to strike a deal. What could go wrong? 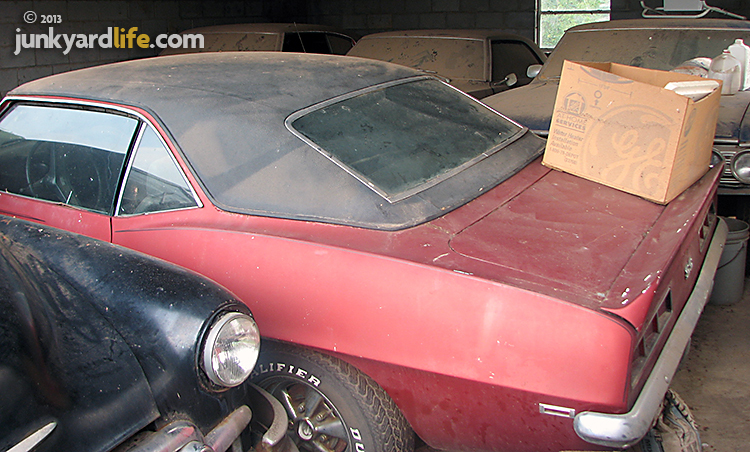 Dig this barn find! A 1970 Chevelle, two 1969 Camaros and a 1967 Chevelle! Meet Bill Jones. He is a lifelong friend, gear head and Junkyard Lifer. Bill and I worked together at a car wash when we were eighteen years old. That job gave us the chance to bench race and discuss teenage automotive engineering. The years of friendship brought many cars and an assortment of interesting people into our lives. 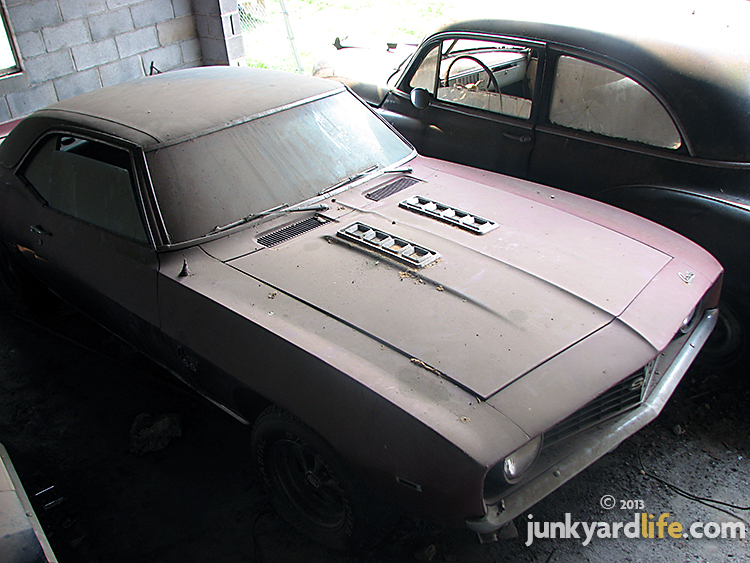 We almost bought two 1969 Camaros out of a barn together. Looking back, we could have been killed (more on that later), but if anyone would ever be killed trying to buy a ’69 Camaro, it would be Bill Jones. Did I mention that Bill loves the last of the first generation Camaros above any other automobile? He has pictures all over his walls, his desk, his computer, his phone. He loves them. As do we. They just have awesome lines and a stance that reminds us of that old “looks like its going 100 MPH standing still” adage people used to say a lot. 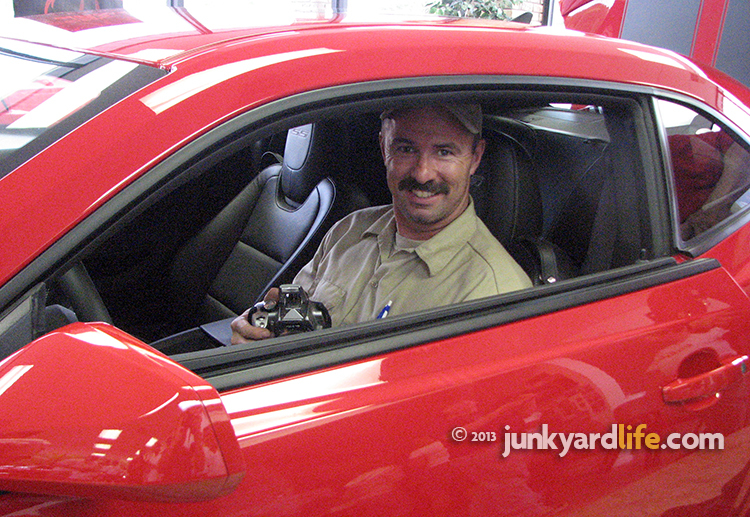 Bill Jones, an ardent ’69 Camaro fan, checks out the "new" 2010 Camaro when they were unveiled. Bill and I were traveling, sometime in 2007, when we stopped in Nashville, Tennessee. If you can believe that we, of all people, struck up a car conversation with a gentleman who worked for the City of Nashville. The man told us about a local urban legend — a tall tale, about a man who hoarded several classic Chevrolets. 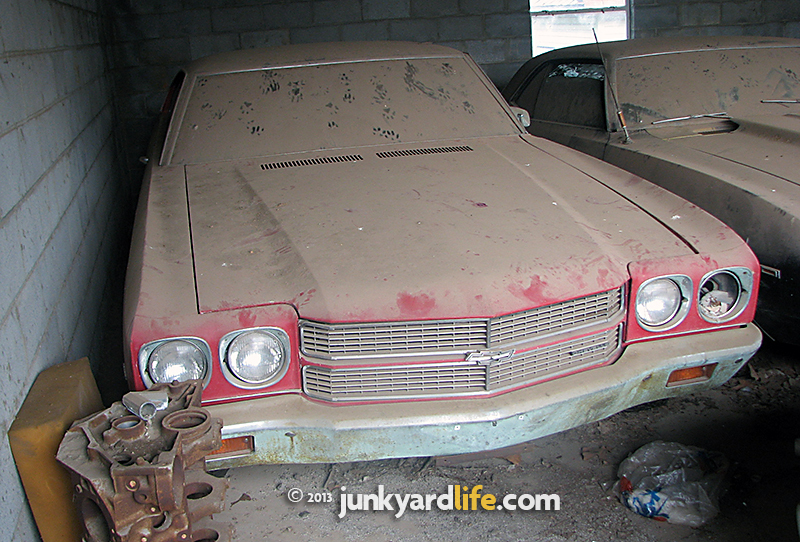 It was said there were two 1969 Camaros in his stash and that he had them stored in a barn but abandoned them in the late 1990s. This story got really strange later. But for now, are you kidding me? Us? 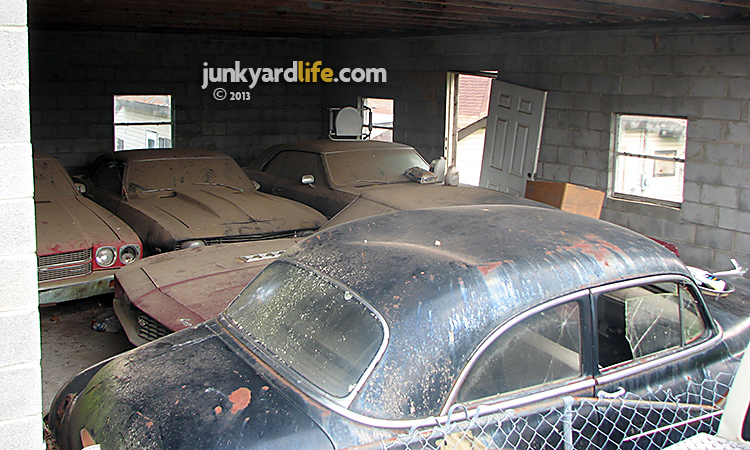 The barn find dreamers? Two Camaros? There are two of us. The math works out great so far. Plus, several other cars? Bingo! We should have known when the legend came with a serious warning… Don’t go! Are you seeing this? A 1950 Chevy blocked the entrance to the four forgotten muscle cars. Why not? A bad part of town? Big deal. Bill and I both had been there and done that. We lived. But, this guy really tried to stop us. He explained that this is the part of town where people get killed. This is the part of town where you don’t go there, even during the day. Forget it. Angry thugs, dealers and trigger-happy guardians of the hood. Do we listen? Did we heed the warning? Did we yield for safety sake? We just heard the part about several classic Chevrolets in a barn, possibly holding Bill’s dream car. So… no. We find the “neighborhood” and in retrospect, put ourselves in grave danger. We just didn’t know it. We located the garage/barn structure fitting the description. It wasn’t hard, it was the only one there. When we got out of the car, we were immediately surrounded by a throng of concerned citizens requesting information on who we were, what we wanted and who we were looking for. Just as we tried to explain what we were looking for, a patrol car rolled up. Whew! We really think the gentleman from the city dispatched an officer to make sure we weren’t stupid enough to actually approach this situation. We focused so much on the 1969 Camaros, that we almost didn’t see the other cars, like the 1950 Chevy sedan, (top right). This red ’69 SS was complete and original. and asked if we could look at the cars. She said “yes”. The officer could not believe it. What can we say? We are charming. As I said, the story was real. 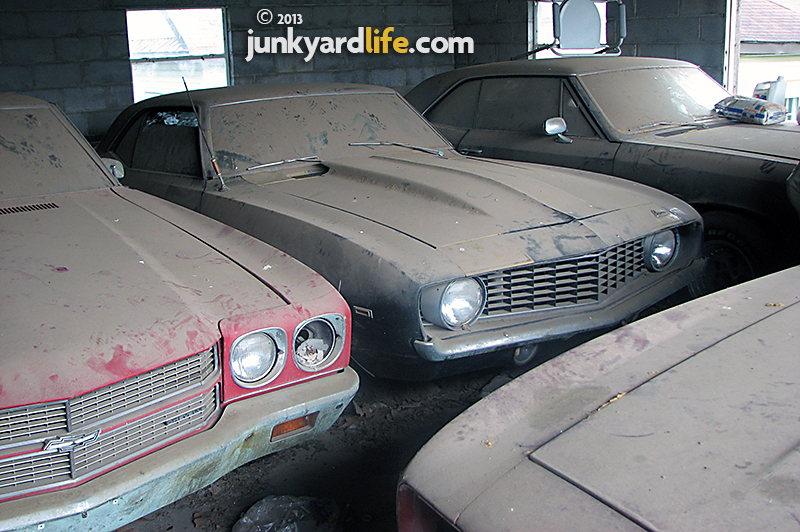 A barn crammed full of Chevys. A 1970 Chevelle, a 1967 Chevelle, a 1950 Chevy Sedan. That was about it. Unless you count the two arrow straight 1969 Camaros. One red Super Sport and one blue Sport Coupe. Bill and I already had those accounted for upon first sight. It was real. Bill put his hand on the red ’69 SS. I put my hand on the blue ’69 Camaro coupe. 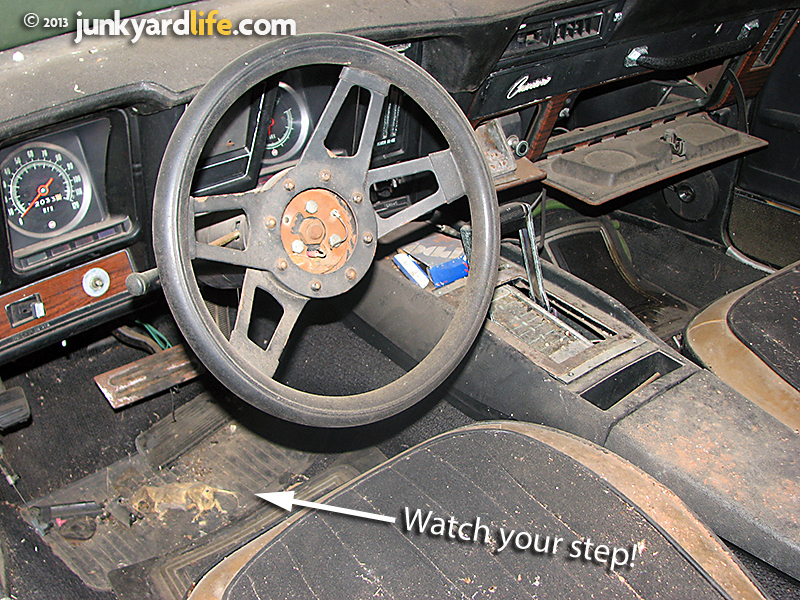 Both had power steering, power brakes and air conditioning. However “my” blue one had some performance mods and someone had removed the air compressor. "Bill’s" red Camaro still had everything intact. His was also of SS pedigree. It sure seemed to be. All the trick questions it answered correctly. The only exception was the lack of the blacked-out rear valance. If this SS was not real, someone went to a lot of trouble to appear so. 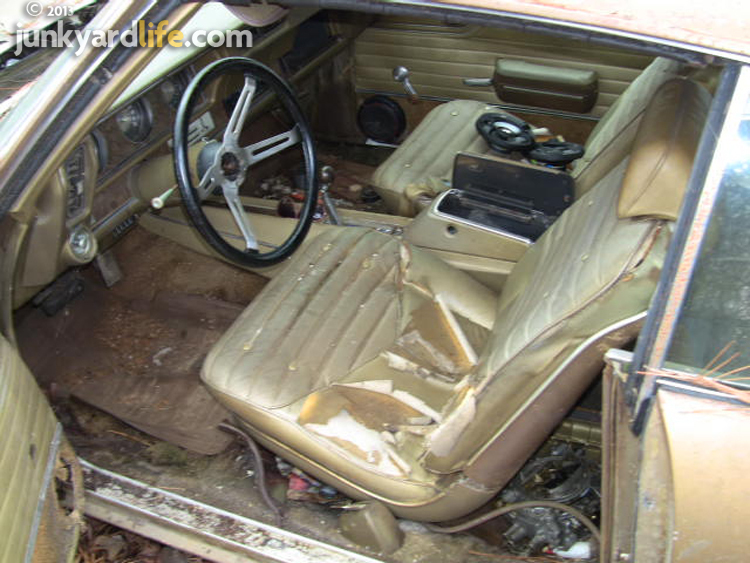 Both Camaros had the expected bucket seat and console combo, although “mine” was redone with crushed velour inserts. As an added bonus, it had a vintage 1969 Z28 steel hood. “His” was the beautiful vented SS hood. Both were automatics with small blocks and rear spoilers. Oh, the plans we made. The 1969 Sport Coupe that should have been mine. Curses! Notice the non-original Z28 hood. Camaro aficionados will probably notice the stripes and plain grill and start to get excited. Could this be a Z28? No. I wanted it anyway. Code 57 Fathom Green was its birth color. It might still be under that layer of dust. The lady who let us see the cars introduced herself as Annalee. She told us the cars belonged to her uncle. The problem with selling them was a lost title and the issue of keys. There were none. Neither detail bothered Bill and I. We asked if we could return sometime and make her an offer. She seemed to respond positively, thus instilling a sense of hope in the two, drooling, car dorks. We went back a week later, ready to work out a deal. Remember, the first time we had an officer drive up by chance. The next time, we asked an officer to come with us. Big mistake. The site of the police officer in our entourage made the neighborhood interrogation team think we were working a sting operation with the cops. Neighborhood lookouts and guys with cell phones to their ear went running in all directions. Annalee was visible shaken and wouldn’t crack open the screen door when we knocked on her door. No doubt, she had been alerted to our “suspicious” behavior. Her answer was a stern “No” to selling the cars. But, showing up with a cop was better than the mistake we could have made. Let the record show a red 1969 Camaro SS with a black vinyl halo top! More money for this 350-V8 SS! We could have been caught in the worst, drug dealer-infested neighborhood in a strange city with several thousand dollars in our pants. Try explaining that to a judge. The other option strikes terror also. We could have easily been killed. That would have been really hard to explain because we told no one where we were going. Jody, Anthony and I have come close to matching that danger due to crazy circumstances that occur when I (Ron) am the common denominator. A year or so later, I see the lady we met, as “Annalee,” on a local news clip giving a tearful plea for information on her uncle. He had gone missing nine years before we contacted her about the cars. But, something was odd. This lady went by a different name. But, it was the same woman! Giving explanation and credibility as to why the cars had been there so long. We later learned that her uncle went “missing” before his legal troubles caught up with him. Missing? We thought she mentioned that she had talked to him? Adding to the mystery, another young man from that neighborhood, with the same last name, was found dead. Some type of drug deal? Was the uncle missing or did she know where he was? And who was she really? Was the dead guy connected to all that somehow? Okay, that’s enough. We are done there. All we know is that the cars are gone. We hope they went to a good place. Happy Hunting, but for Heaven’s sake, be careful and stay clear of situations like this. 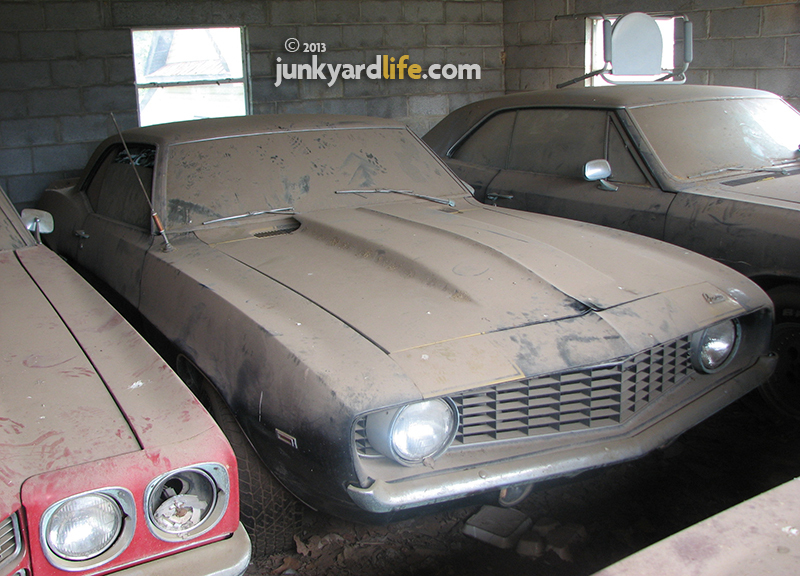 Is there a better barn find duo than a 1969 Camaro sitting next to a 1970 Chevelle? The last of the first generation Camaro was more like a human hypnotic design victory than it was a car. The 1969 model is beautiful from every angle. This was the blue ’69 that Ron was ready to own. Chevy built 34,932 SS model 1969 Camaros. 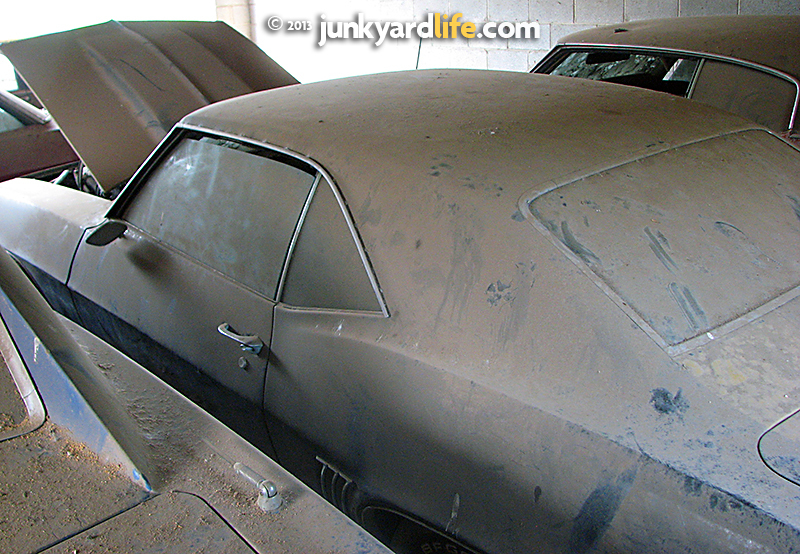 Can I buy a 1969 Camaro SS barn find? It almost happened once, could it happen again? There was also a 1967 Chevelle, (on right above). 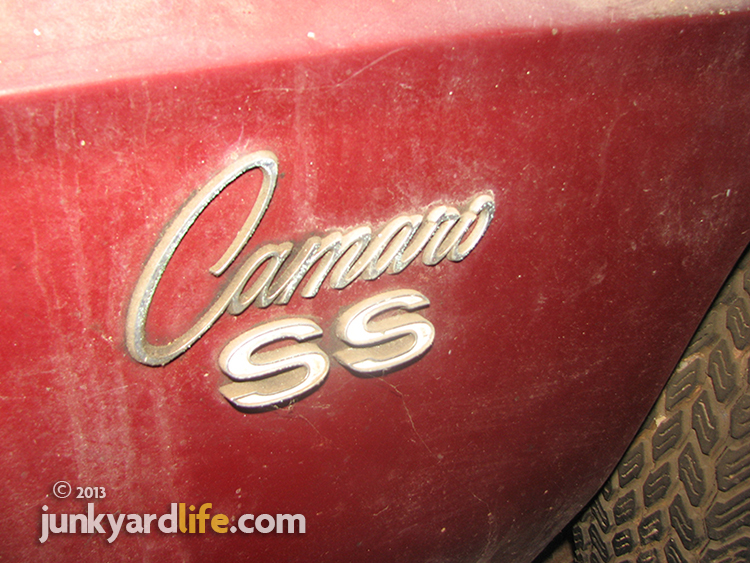 I don’t remember much about it, I had barn find Camaros on my mind. A peek between the fenders revealed a 350 in the SS with a lot of good stuff attached, like A/C. How cool art thou? Don’t subtract original points for the chrome aftermarket air cleaner – Bill probably has a factory one on his wall. Matching black interior and a very cool standard SS steering wheel. It looks fabulous in this upscale Camaro. This under the hood shot provides a clue. Being a factory A/C car, and an automatic are for positive signs this was not a Z28 in stealth mode. That Holley carb does look a little suspicious. It wouldn’t surprise me if it was a factory 780 CFM from some other Chevy monster. With that huge intake and that double pumper, it makes me wonder if that mouse can drink all that! 1969 Camaro Super Sport models, Big Block & Small Block, were equipped with the velocity stack ornamentation hood (above) or the ZL-2 cowl induction hood. 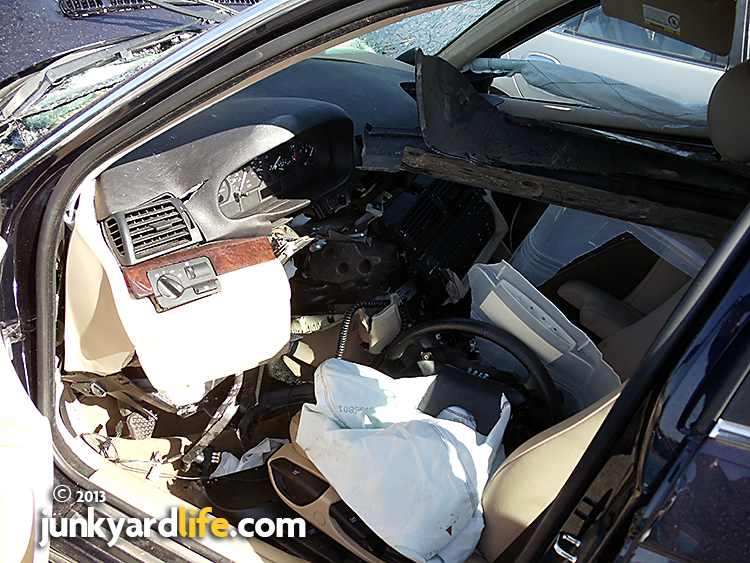 Aftermarket interior items such as the steering wheel and seat material are present. Who wants to play “Wheres Waldo” with the dead rat in the floorboard? That would have been ironic if this was a big block Camaro. A good example of a 1970 base model Malibu. 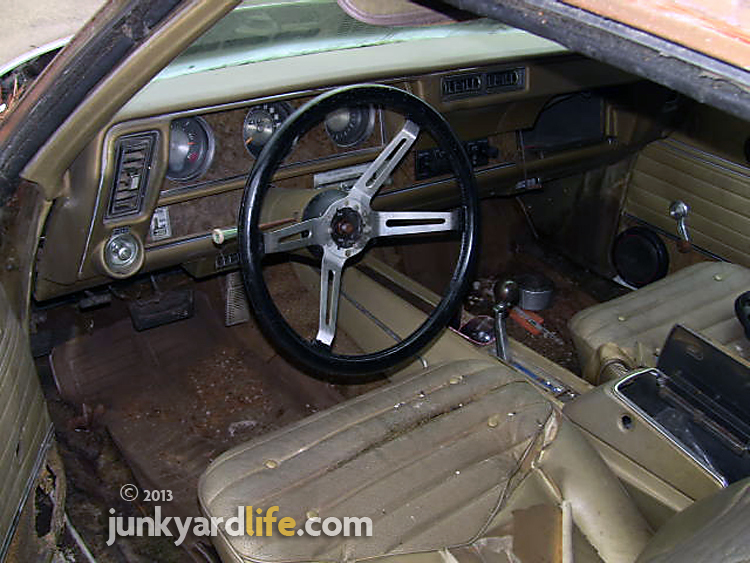 It seems like it was a standard issue bench seat with a column shifter. I wonder if the big block on the ground in front of it was allocated for the same car? It would fit. 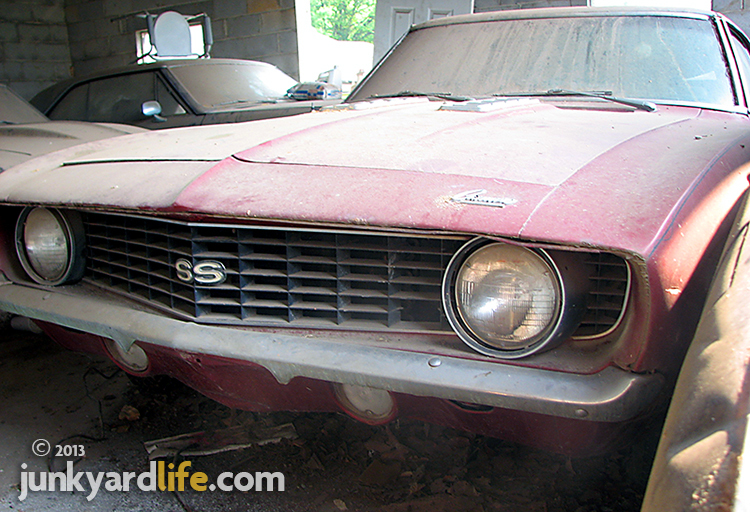 Know of a barn find or a junkyard that we need to visit? 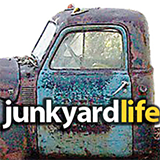 Send us the info at Junkyard Life. It was the wreck that didn’t happen that scares one veteran drag racer. 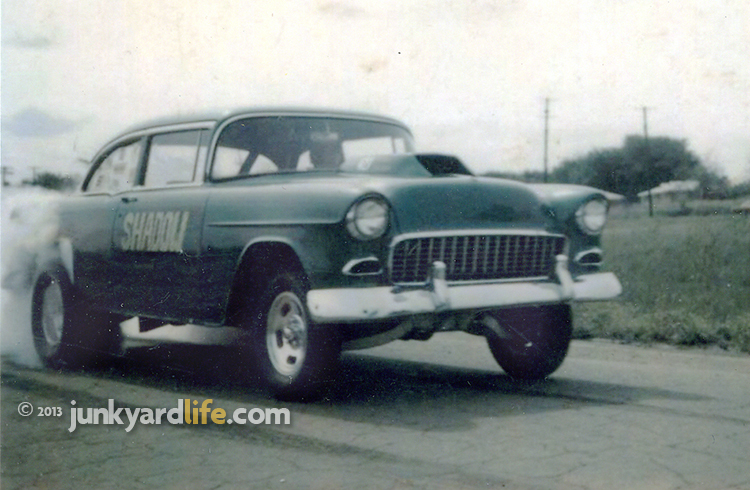 Raymond Coulombe dug out old photos of the 1955 Chevy that he raced at drag strips across Alabama from 1969 through 1971. The ’55 was fast and known as the ‘Shadow’ by the gold leaf lettering, outlined in black paint, on each door. Many competitors feared the “Shadow” and its quick 10.6 second, 1/4-mile elapsed times. A combination of strong equipment, determination and skill made winning look easy in the “Shadow.” But, Coulombe also had a bit of luck on his side, when he avoided disaster and a flipping, crashing, Hemi-powered 1968 Dodge Dart, during a match race. These photos are proof that this L88, big block ’55 Chevy was king of the mountain during the glory days of the muscle car era. 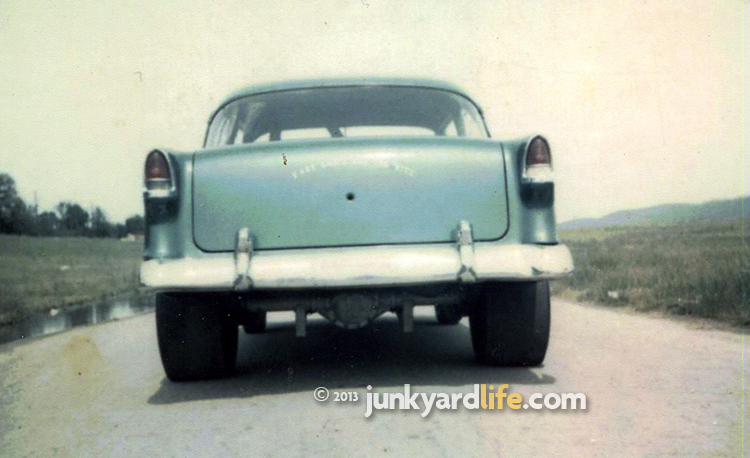 Slicks and cut fender wells were common on 1955 Chevys at the drag strip. The "Shadow" ran the 1/4-mile at 130 mph on the big end of the 1,320. Jimmy Lemon was a teenager, fresh out of high school in 1969, when he met Raymond Coulombe (known as "Columbia" to many) while hanging out at the local drag strip. Coulombe, then 26, was known for buying junkers and building them into drag cars. After racing them a few times he could sell the drag car for a profit, which paid for more racing. Lemon was lucky enough to buy one of Coulombe's cars before he started building it into a drag car. Lemon paid Coulombe $150 for a primered, 2-door post 1955 Chevrolet Bel Air in 1969. Coulombe provided his expertise in turning the stock ’55 Chevy into a B Modified drag car. Lemon paid for the parts and learned how to go fast. Coulombe set-up the suspension for drag racing and built the close-ratio, Muncie 4-speed transmission. He also sprayed the green paint and added a roll bar to the ’55. Coulombe, with help from Lemon and their friend, Randy Boatright, built the 427-ci big block engine and ported and polished the heads. Most of the work on the 3,400-lb Chevy was done after hours at a local service station, owned by John Jebeles, in East Lake, Alabama. Coulombe, a proven winner, became the “Shadow’s” primary driver as the trio traveled to drag strips all over the state in a quest for prize money and bragging rights. Lassiter Mountain Dragway, where the ’55 Chevy often raced, was a quarter-mile track in the early 1970s. The "Shadow" is racing a 1940 Willys at Lassiter Mountain in the top photo. Drag racing by nature is not the safest sport. In the early ‘70s, disaster almost struck the “Shadow” during a match race with Tommy Payne’s 1968 Dodge Dart Hemi Super Stock at the Winston County Drag Strip in Lynn, Alabama. "Payne got a good jump on me because he knew the lights better at that track," said Coulombe. 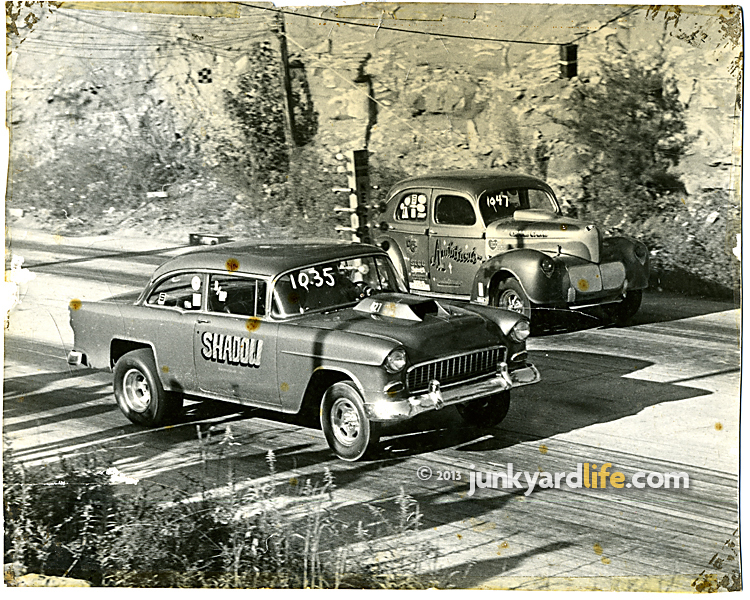 The Hemi Dart had the lead on the “Shadow” but the ’55 was closing fast as they neared the finish line. The Hemi Dart, racing in the right lane, got into trouble when its right, rear slick veered off the track. The Dart took a hard left, in front of the "Shadow," flipping into the air. Coulombe muscled the steering wheel to avoid hitting Payne's tumbling Dart head-on. The Dart’s rear bumper creased the top of the "Shadow’s" left fender as Coulombe swerved under the flying Dodge. Coulombe’s maneuver sent the “Shadow” spinning wildly down the track at 100 mph. The one-of-72, factory built, Super Stock Hemi Dart was totaled in the crash. More importantly, Payne suffered only minor injuries. "He got a some cuts, bruises and glass in his eyes from the windshield," recalls Coulombe. "I believe they saved the Hemi running gear and scrapped the rest of the Hemi Dart." A bent fender on the "Shadow" and a very close call meant it was just another exciting night at the races. A 1969 El Camino was the tow vehicle for the "Shadow" 1955 Chevy in 1971. After the ’55 Chevy won it’s last race in Montgomery in 1971, Lemon took it for a final, rubber-burning blast. The “Shadow,” hauled on a trailer behind Lemon’s 1969 Chevy El Camino, was unloaded on a stretch of wide-open, surface roads near the Birmingham, Alabama airport. The guys performed smokey burnouts (known as hooning by kids nowadays) and general recklessness on the open road in the loud, hot rod ’55 Chevy, one last time. Soon after, Lemon removed the engine and sold the rest of the 1955 Chevy in hopes of finding additional speed in a more aerodynamic car. Lemon bought another car from Coulombe – a 1969 AMX Javelin. Lemon’s new drag car never matched the performance of the Shadow, despite using the “Shadow’s” engine and transmission. The "Shadow's" last run before it was dismantled and sold. The ‘55 Chevy was a high RPM, high compression hot rod. In 1969, performance was easy to find at your local dealership’s parts counter. The “Shadow” used an L88 engine with the factory short block. Coulombe hammered out 8,000 RPM runs on a factory crankshaft, rods and pistons. That’s brute force without a power-adder like nitrous. Drag racers were building their own beasts for the local strips during the peak of the muscle car era. The 1955 Chevy's hot rod L88 engine. 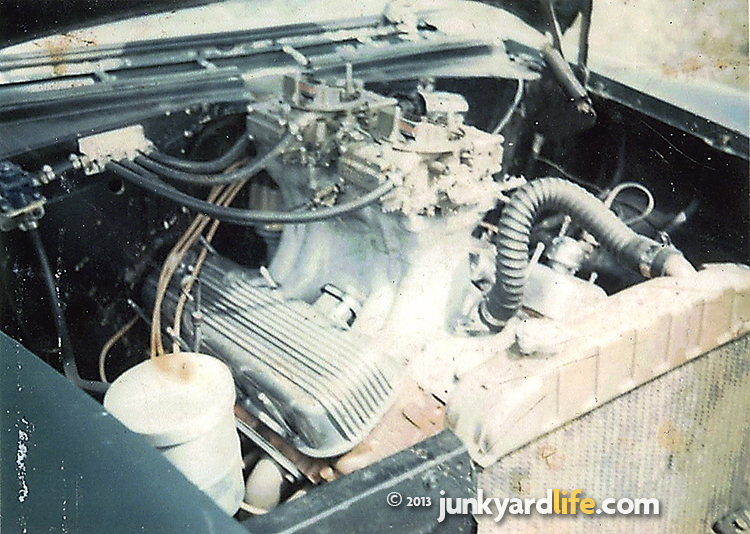 427 cubic-inches, tunnel ram and two Holley 650 cfm carbs with manual secondaries. The "Shadow" returned to Coulombe five years after Lemon sold it. "I bought it and it was just a shell," said Coulombe. The ’55 had been raced a few more years and the name had been painted over on the doors. Coulombe didn’t keep it long. He sold it and made a few bucks. "All the good parts were gone. I didn’t even want it," Coulombe recalls. "But I sure wish I had it now." Did you see the Shadow? Does anyone have photos of The Shadow in action? Do you remember seeing it, or other memorable drag cars perform in their prime? 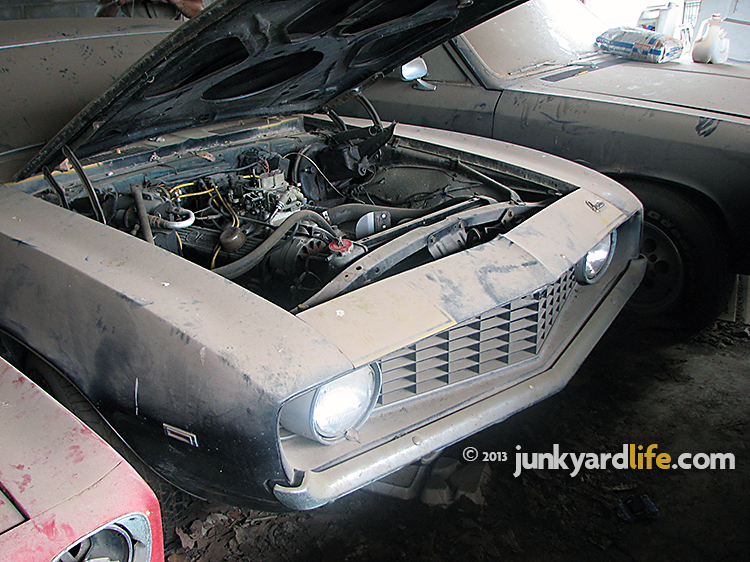 Dig out those vintage drag race photos and share your stories with junkyardlife. The "Shadow" utilized a 5.13 gear in the rear end and wound the 427-ci, L88 engine to 8,000 rpm. Not bad for an old 1955 Chevy bought during the muscle car era for $150. Craigslist 4-4-2 project car has parts, profit. I make it a habit of reading through the Craigslists ads almost every morning, looking for that deal that just seems to stand out from the others. On most days, I see very little that actually interest me. Either the cars are priced too high, or they have too many doors, or both. On this particular morning, I noticed what was advertised as an original Olds 442. 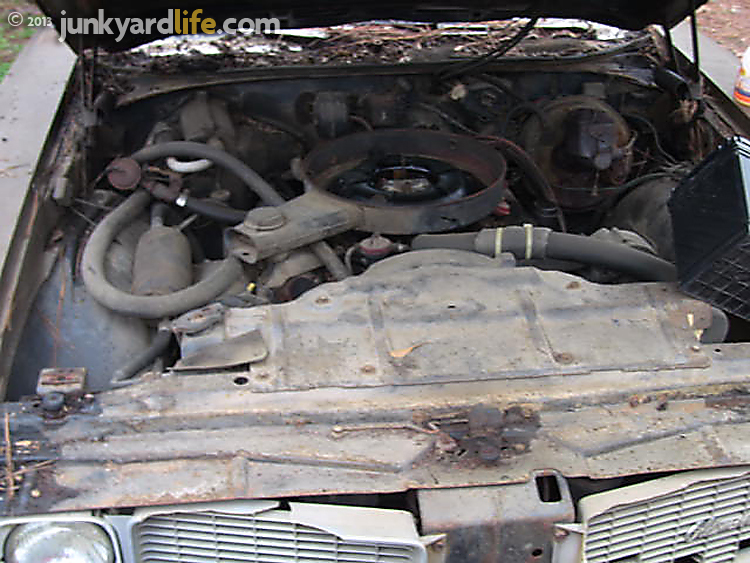 The pictures accompanying the ad showed a rough looking 1970 Oldsmobile 442 with a Ram Air hood, or what Oldsmobile referred to as the W-25, OAI hood. The OAI stands for Outside Air Induction, and these hoods are highly sought after. As are the OAI air breathers, which amazingly, was still on this car. Also seen in the photos were the bucket seats, sport steering wheel, sport mirrors, and four original rally wheels. Even with all these coveted parts still on the car, the price seemed a little high to me. Yes, it was a complete car, but it wasn’t running, it was resting on four flat tires, and I could see in the photos there was a lot of rust in the quarter panels. And at $3,600.00, I was hesitant to even consider wasting my time, let alone the owner’s. But already owning a 1970 Olds 442 convertible, I felt the urge to at least go and take a look at the car. Yeah, I’m that guy, the one who answers your car ad with a lot of questions and no real desire to actually buy another car, especially another project car. I called the number and the gentleman on the other end of the line was friendly and willing to answer my many questions. He told me he was selling it for his wife and that she had gotten it after her father passed away. Her father owned the car for a couple of decades, during which he had meticulously restored it, and then for some unforeseen reason, he parked it in the woods out behind his home. The story was intriguing and I had some concerns, but the seller assured me the car had a current registration and it was in his wife’s name. So with this reassurance, I plugged his address into my GPS and was out the door. Years of sitting in the mud had taken its toll on the lower body panels as well as the frame. This, combined with the fact the car wasn’t an original 442, made the car a poor choice for a restoration. The car was located beside a trailer in rural Alabama, not far from Birmingham. A motorcycle was chained to the front bumper, both to protect the engine compartment from sticky fingers and to prevent the motorcycle from being stolen. 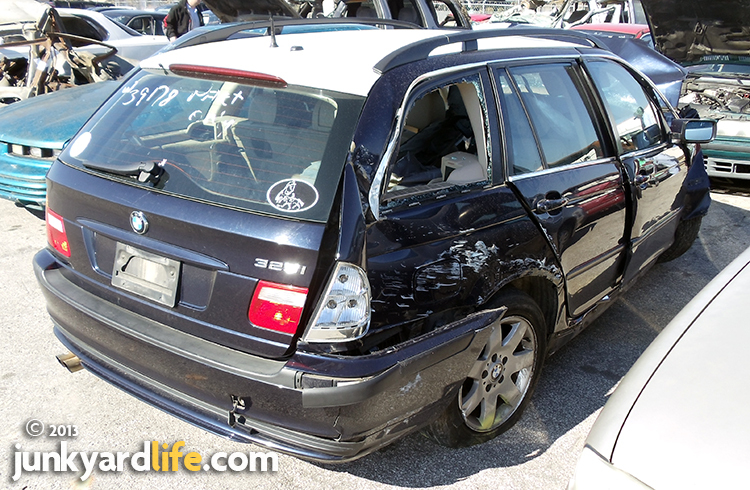 The previous owner had just recently passed away and his daughter was handling the estate, which included about fifteen vehicles. Most were older classics or muscle cars, and by this time most of them had been sold off. I could tell by looking at the 442, it had been at one time, a prized possession, garnering the owner’s attention and care. The car was complete from bumper to bumper and everything looked to be original. I was only able to tell the car wasn’t an original 442 by decoding the VIN and the data plate. It was obvious to me that the previous owner was an accomplished mechanic with an eye for detail. The only thing that didn’t make sense to me was why the car had been relegated to the elements, where it sat for about ten years, rusting away. 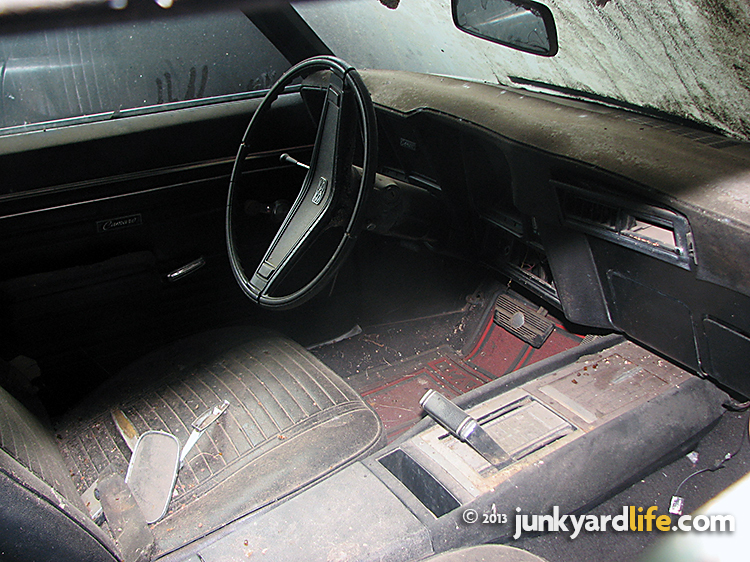 Although it looks rough, the interior is in fairly decent shape. The presence of the bucket seats, center console, shift linkage, steering column, and sport steering wheel, all add value to the purchase as these parts are all highly sought after by people restoring these cars. The car was complete but it was originally a Cutlass Supreme that was properly converted to a 442 “clone.” It was sporting an original, W-25 OAI hood, a 455ci Oldsmobile engine out of an earlier model Olds, bucket seats, center console, sport steering wheel, original SSII rally wheels, and a 3.42 posi-trac rear-end. I also found 442 emblems properly located on the fenders, trunk, and dash. The only 442 parts it was lacking were the boxed-in rear trailing arms and the 442 emblems on the hood. When I arrived, I had no intention of buying the car. I was just, as they say, kicking tires. Which in this case, were all flat. But the car was full of great, hard to find parts. I found it too difficult not to make an offer. I didn’t really low ball the owner; rather I gave a fare offer based on the sum of the parts on the car. I also gave the seller a standing offer that would be good for one week. That would allow the seller time to find another buyer at a higher price, while still having me as a backup should the car not sell. The offer had one caveat: the seller had to sell me the original OAI air cleaner right then and there. Believe it or not, my whole reason for wanting this car was the OAI air breather, seen here still on the car. The vacuum operated flapper lid is resting on the roof of the car. It was missing the manifold heat riser. My offer was twofold. First, the seller was moving out of state fairly soon so I figured that I could get the car at a reasonable price if no one else picked it up, and second, I live in a newer neighborhood that is governed by a Home Owner’s Association or HOA. And if you don’t already know, HOAs have rules about having cars sitting on blocks in the driveway. I really didn’t want the headache of listening to the HOA. But I did have a need for the original OAI air cleaner still sitting on top of the engine in this car. Much to my surprise, the seller made a reasonable counter offer to which I replied, “If the car ran it might be worth that price”. Low and behold, an hour later we had the car running. A battery from the owner’s shop and a glass jar full of fresh gas was all it took. After years of neglect, it was in definite need of a tune-up, but it ran. So we shook hands and I gave the seller a deposit. As excited as I was, I also had two small issues to contend with. First, I didn’t have a truck and trailer, so I needed to hire a tow truck, and tow trucks can be quite expensive. Second, my garage already had two classic cars parked inside, and there was no room for a third. So this car would have to sit in the driveway. Normally this would not be an issue. I can usually wash a car and put a license plate on it. But this car had four flat tires and a good bit of rust and grim. This wasn’t going to be an easy pig to dress up. 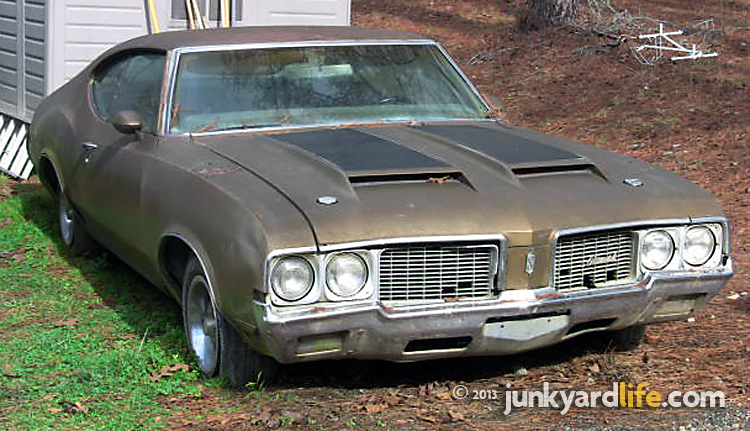 At first glance, this 1970 Cutlass Supreme appeared to be an original 442. The grille along with the emblem on the hood tooth indicate the car is just a Cutlass Supreme. Decoding the VIN tag confirmed the car’s true identity. How much to tow it? After calling around to a few different towing outfits, I learned the difference between hook-up charges and the cost per mile to move the car. Both of which apply, a double whammy. Hook-up charges are the cost of just putting the car on the truck. They average $75.00 in Birmingham, Alabama. And the cost of moving the car is $2.50 per mile on average. 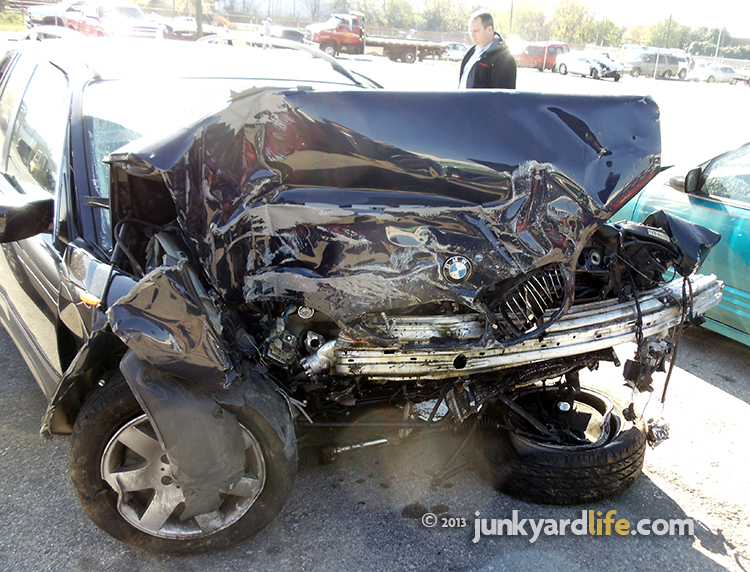 This car was located roughly 45 miles from my house, so I was in for a rather large towing bill. My enthusiasm was fading fast. After calling around to a few different towing outfits and getting this very rude awakening, I called a friend of mine who owns a local auto repair shop. He recommended a small owner-operated towing outfit that he uses. The first quote from this smaller outfit was almost half the cost of what everyone else was charging. The actual quote given was $2.50 per mile, but without the hook-up charge. Of course, I immediately accepted it. I have to admit, as I stood at the seller’s home, waiting for the driver to arrive, I kind of expected a bum in a 20-year-old truck to show up. To my surprise and delight, an older, professional-looking driver with a new truck and years of experience arrived, and right at the agreed time. I appreciated the care he took loading and unloading my newly acquired 442 “clone.” He treated this parts car as though it were a new car. I was fortunate to get his number. And I have used his services a couple of times since. When you drive a classic car as a daily driver, you always have a towing company’s number programmed in your cell phone. It’s not a matter of if you’re going to break down, but when you’re going to break down. The craigslist Cutlass in my driveway. Unfortunately, for the classic car hobby, most communities frown upon having cars like this left out in plain view. After getting the car home and unloaded, I spent some time talking with the neighbors. Apologizing for the car and letting everyone know that I would get the Cutlass moved as soon as I could. I am extremely lucky to have reasonable neighbors. They all know I am a classic car enthusiast and are very accepting, even though I am the only one in the neighborhood who drives a classic car. No one complained and I received no letters from the HOA. 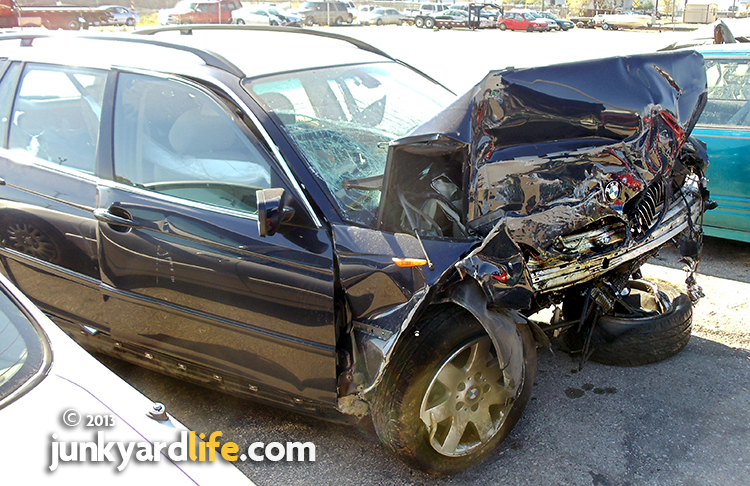 Fortunately, for everyone, the car was sold less than a week later. I removed the OAI air cleaner and a couple of other small parts from the car before selling it to another Olds enthusiast from Tennessee. His plans for the Cutlass were pretty much the same as mine, take the parts he needed for his project and then sell the car to someone else. In the end, a day of kicking tires paid off big. I was able to find a rare part I was sure I would never find and make a little money while doing so. Just of note, this particular car wasn’t an original 442 and had little real value other than as a parts car. The rear quarter panels were toast. The trunk and floors weren’t much better. The seats were questionable. If anything, the seat frames might have been salvageable. I was able to sell the car quickly because of the hood and posi-trac rear-end. 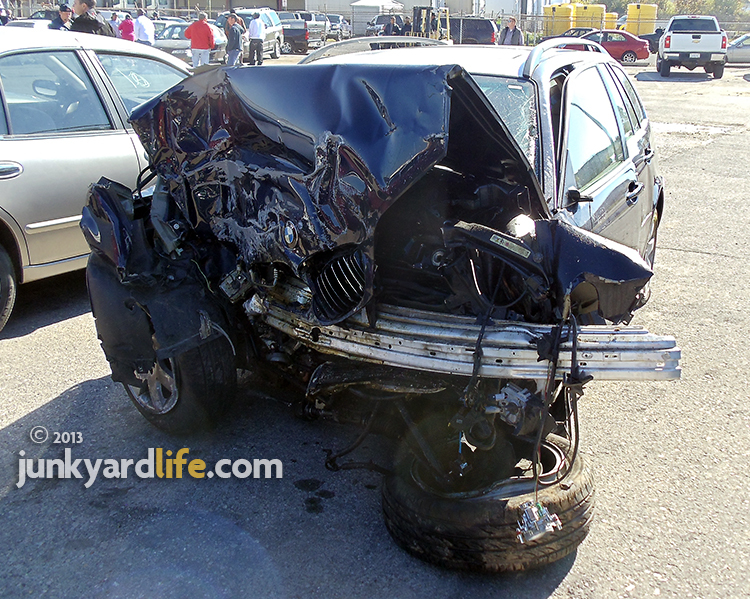 As much of a shame as it may seem, this car was too far gone to justify the expense of putting it back on the road. So it was used to restore other, more desirable cars. 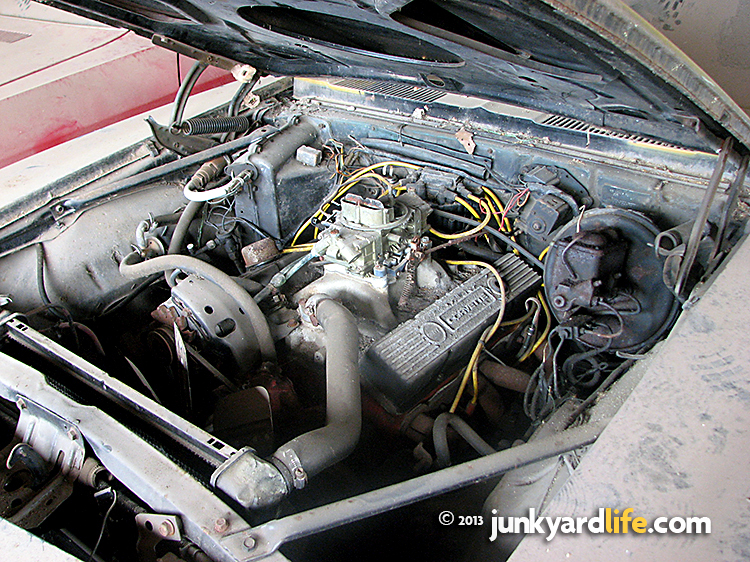 This 1970 Olds 4-4-2 "clone" has many options – bucket seats, center console, sport steering wheel and a/c. About the writer: Being the son of an old hot rodder, I guess you can say it’s in my blood. As a kid growing up in the eighties, I used to help my old man wash and wax the family car, a 1957 Chevrolet Bel Air. On my 16th birthday I bought my first car, a 69 Ford Torino GT. 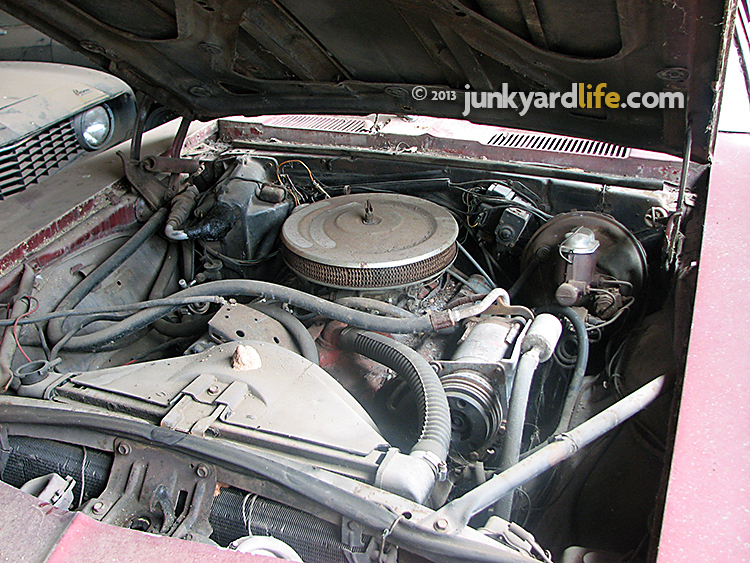 I spent all my free time cleaning that old car and tinkering under the hood. Now, more than thirty years later, I find myself doing pretty much the same, except now it’s a 1969 Cutlass Supreme that takes up all my free time. And like most of our readers, I also enjoy roaming the back roads, looking for those infamous barn finds that everyone dreams about. Do you have a great car story? 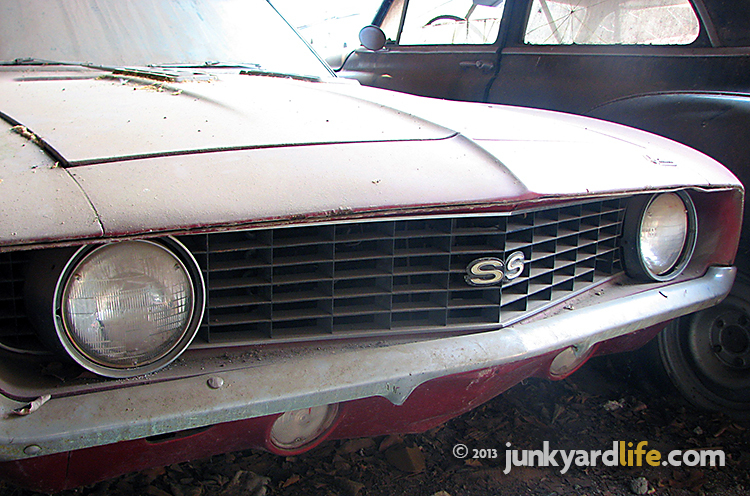 Know of a junkyard or car collector with character that I should visit? 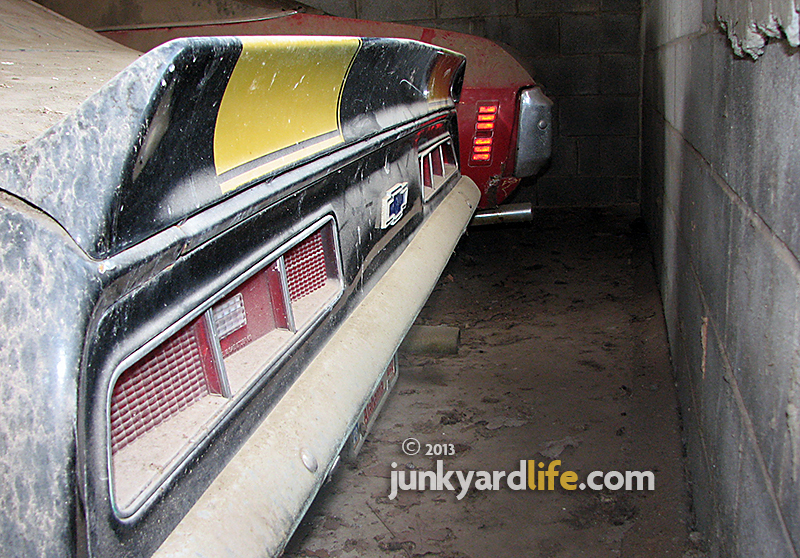 Send photos or info to junkyardlife at junkyardbull@gmail.com.